No Way Back is not a festival, it is not an event - it is a party. If you don't understand the touchstones of this party, it might be impossible to explain. It is a comment on a continuum. For many of us it began the 90s, searching through fliers at Record Time, calling info lines and buying your ticket at Zoot's only to get lost trying to find that elusive warehouse. What was inside? Something amazing... This is our generation returning to the source, feeling a freedom and a heat within the music that resulted in speaker freaking. Every generation experiences this without the aid of a night club time machine, whether it was at The Loft, Better Days, The Paradise Garage, The Warehouse, The Shrine, Cosmic, Luomos, The Muzic Box, The Hacienda, Medusa's, The Music Institute, or Berghain. You might not even know that you have soul until you experience being totally lost in the mind control music and realizing there is no way back. Every DJ chosen to play at No Way Back is a master of their medium, so deep in it that they all serve as constant inspirations. This is a celebration of the lost art of the late night Midwestern DJ. 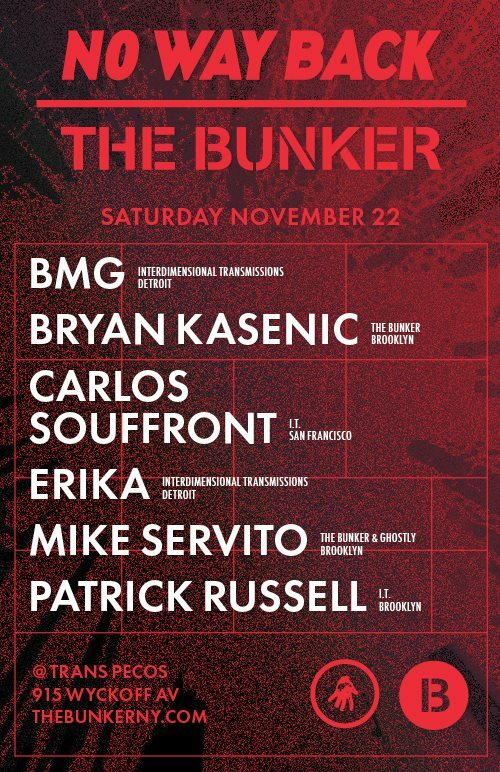 This is what makes the collaboration between Interdimensional Transmissions and The Bunker so effortless, as they both are champions of this, with The Bunker residents like Mike Servito and Bryan Kasenic being long time IT collaborators.